In this video we will discuss about displaying GridView in another GridView. 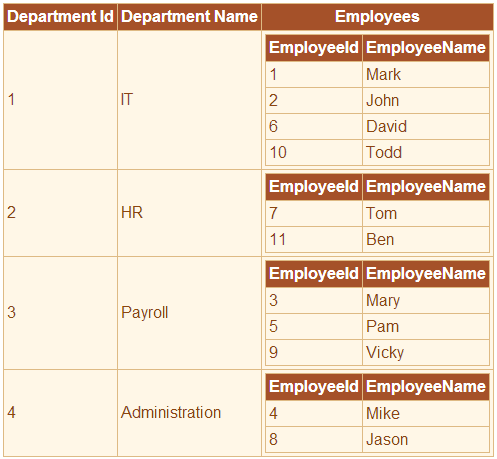 For this example we will be using tblDepartment and tblEmployee tables. Use the sql script below to create and populate these tables with sample data. We want to display Employees gridview, with in Departments GridView as shown below. Step 3: Drag and drop a gridview control on webform1.aspx. Create 2 bound fields and 1 template field. Use another GridView control, in the ItemTemplate of the TemplateField. Hello sir In c sharp videos part no-56 you have told about generics after that in the next session you told that there will be videos on Collection but there is no video on collection, so if it is possible can you record videos on Collection ..
could you please share a video on gridview within the gridview using javascipt... expand and collapse.